We spent 12 hours testing out 11 different two-way coffee makers. Taking cost, capacity, and ease-of-use into account, we’re happy to recommend the Ninja CF085Z as the best dual coffee maker for most people. Two way coffee makers are pretty much exactly what they sound like – one machine that can brew a larger pot of coffee, but can also brew a single-serve cup of coffee as needed. Sometimes “two way” can also refer to models that brew coffee but also come with a plain hot water dispenser, for tea, coco, or other hot drinks. 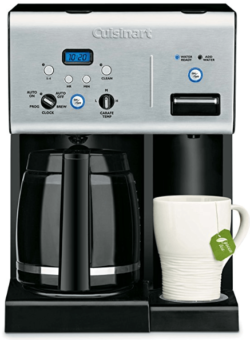 Many of these dual systems brew pots of coffee with coffee grounds, but use k-cups or coffee pods when brewing on the single-serve side of things. In this article, I’ll be helping shed light on key factors you should look for in a dual coffee maker. But first, I will be giving you a list of the best dual coffee maker on the market today. By the end of this discussion, I guarantee you will already have a clear conclusion as to what model is ideal for you and your needs. To help you narrow down your choices I have taken it upon myself to compile a list of the best dual coffee makers on the market today. I’ll also give you a quick review, along with pros and cons, to help you understand the strengths and weaknesses of each model. A different option for brew sizes. Comes with a thermal carafe. Milk froth is easy to use. Brewing process does not produce the level of heat as other coffee makers. The Ninja Coffee Maker CF085Z excels as being a user-friendly coffee maker that brews flavorful coffee without any problems. In fact, even people with little to no knowledge of brewing coffee can easily operate the Ninja Coffee Maker CF085Z. This is thanks to its Auto-iQ one-touch intelligence feature. The technology automatically knows the right amount of water you will need to brew your coffee based on the brew type and size you will choose. You will also get a double wall thermal carafe that comes with the CF085Z. This should help keep your coffee tasting fresh for up to two hours without any changes to its temperature. A great inclusion if you prefer to have some extra coffee reserves throughout the day. Comes with a variety of attachments. Can brew both coffee ground and pods. Glass carafe utilizes spill-free design. The large and bulky design will require extra space. Single-serve attachments might be a bit complicated to use for beginners. Brewing time is relatively slower in comparison to other coffee makers. 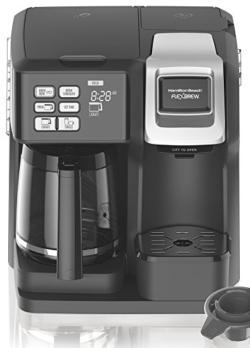 Another user-friendly dual coffee maker that is highly recommended in coffee enthusiasts’ circles is the Hamilton Beach 49976, Coffee Maker. Button placements are easy to navigate and operate. It also uses button illuminations in order for you to determine what brewing operation is currently being used. The 49976 also features separate chambers located on both sides. These chambers have a see-through window that will help you avoid overfilling the chambers during brewing. This coffee maker also comes with several accessories such as the K-cup pack holder for use with coffee pods. Each attachment has different colors which should help differentiate each at a glance. Also, every attachment of the 49976 is dishwasher safe making it a breeze to clean. Can serve up to 12 5 oz cups of coffee at once. The brewing process is quite fast. The carafe is not well-designed and is susceptible to dripping problems. 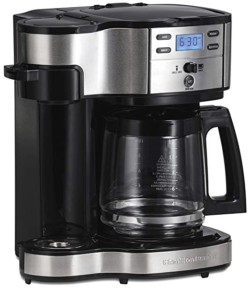 The Cuisinart SS-15 Coffee Maker takes the features of the SS-10 and DGC-3200 models and incorporates it into itself for a top of the line coffee maker product. This powerful machine is designed to accommodate all coffee brewing needs without any hitch. The SS-15 features a specially designed hot plate control that should avoid burning coffee beans. To further prevent this problem from happening, the SS-15 now includes a 3-setting temperature option for the hot plate. Another helpful feature included in the SS-15 is the power loss backup system which remembers your settings even after a power outage. It also features advanced Smart technology which notifies you when the machine needs to be cleaned. It also has an emergency switch that stops the brewing process if needed. As for the Cuisinart SS-15 serving options, you can choose from 6 oz, 8 oz, and 10 oz. It can also brew 12 5 oz cups of coffee at once. Choose between large servings or single servings. Compatible with both ground and coffee pods. The pod holder is not compatible with Keurig K-cups. 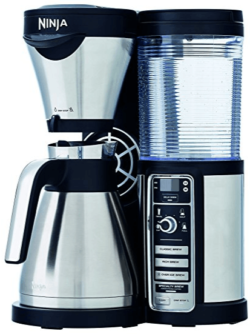 The Hamilton Beach 49980A Coffee Maker is a two-way coffee brewer and can process both a single cup or a full pot. It utilizes a single serve tank which is great if you prefer a controlled amount of coffee. The larger chamber, on the other hand, is great if you will be serving for a couple of people. The larger tank also has a measuring marker that will prevent you from overfilling the chamber. I also liked how the single serve side of the 49980A comes with a mesh basket filter which eliminates the need for filter papers. This filter is also compatible with both coffee grounds and coffee pods. The drip tray is also adjustable to fit different cup sizes. It also has a brew strength setting that allows you to adjust the strength of your coffee from standard to bold for a richer flavor. The timer can be programmed up to 24 hours so you can set it before you wake up. A great choice for people who want to wake up to the sweet aroma of coffee being brewed. 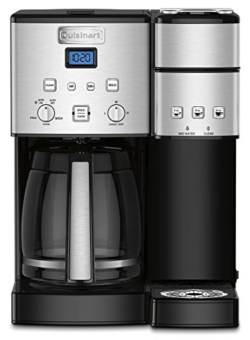 The Hamilton Beach 49980A is a solid choice for a dual coffee maker. It is well-made and easy to use. It also comes with several helpful features that improve convenience. Great coffee maker which you can also use to prepare tea and oatmeal. Brewing timer and pause functionality. The heater is installed separated from the coffee maker. Filling up the water reservoir is a bit awkward due to the design. The machine is relatively loud. The Cuisinart CHW-12 is another top-notch dual coffee maker that comes in both black and stainless steel with the metallic red variant. The CHW-12 comes in a decent size, not too big but not too small as well. It can serve up to 12 cups of coffee in a single brew. The CHW-12 also features a completely automatic brewing and cleaning system. In terms of convenience, it’s pretty on point. It comes with a Carafe glass that is made from the BPA-free material. The CHW-12 is easy to use and can produce an exceptionally hot and flavorful coffee. You can also prepare tea with this machine as well. The 3-year warranty is also quite nice and shows the manufacturer’s confidence in their product. It’s another product that I personally recommend for coffee lovers who wish to make the most out of their purchase of a dual coffee maker. It’s important to note that while this unit does have a single serve hot water dispenser, it’s not meant to be a single serve ground coffee/K-cup dispenser. It’s meant to provide single servings of hot water for tea, coco, or other hot beverages. Two Way Coffee Maker Buying Guide – What to Look for? When choosing a dual coffee maker, it is important to know what you want. Standard coffee makers are a dime a dozen and should suffice if you like a simple cup of joe. However, if you enjoy a little variety in your coffee – say an espresso, or a maker that can also serve you up a hot cup of tea or coco – then you will need to dig a little deeper when it comes to the features the coffee maker has to offer. As stated earlier, it is important o figure out whether you want a standard coffee maker or something that can offer a variety of coffee. Most of the coffee makers you see in the market can only make your standard coffee. Check the option for each coffee maker to see what other coffee variants they offer. This can greatly narrow down your choices, so start with this category. How many will be using the dual coffee maker? Will you be placing it in your home or office? Dual coffee makers come with several size options. A standard coffee maker is large enough to brew one pot of coffee. Determine the size options when looking for a coffee maker, this will help prevent you from brewing too much or too little coffee. What coffee form do you prefer to process with your coffee maker? There are coffee makers that process coffee grounds when brewing while there other that requires the use of pods. Figure out which type of coffee will be more convenient for you to get and make. Many dual coffee makers do brew both coffee forms – perhaps coffee grounds for a larger pot, and K cups for single serve mugs as needed. Each product included in this list is a solid choice. It all depends on your personal needs, really. We can guarantee that all 5 are great investments for coffee lovers. Go ahead and pick one based on the buying guidelines from earlier and you won’t be disappointed! The Full Moon Cafe is a small team of coffee-lovers. We publish in-depth brewing guides and equipment reviews. Our goal is twofold: To spread the joy of coffee, and to help you make informed buying decisions as a consumer. Check out our About Us page to learn more!